I learned how to play Crumple and Shoot from Doris Gannon, a reading teacher I worked with in my first job, and since then I’ve passed it on to more people than I can remember. It works with students from elementary school through college, and I’ve never had a group who didn’t eventually beg me to play it. Plus, it’s so easy, you could literally start playing it the minute you finish reading these instructions. The only real requirement is that your students need to be able to write easily, so it might not work as well with very young students. 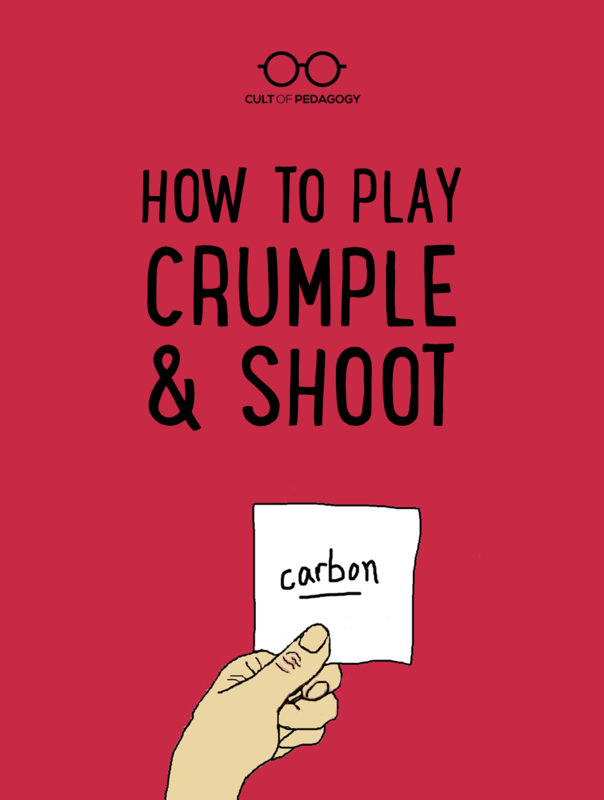 Download full instructions here: How to Play Crumple & Shoot. LOVE THIS!!! I will definitely use “crumple and shoot”!!! Thank you so much!!! I play a shooting game called Blitz Ball, which if a team gets the answer correct they get to take a shot at my Blitz Ball board. It actually has five holes and I randomly give each hole points. I also like the idea of “crumpling and throwing”…the kids each write their own question on a piece of paper(or I can) it is crumpled and thrown. Everyone must pick up one of the papers and write their response to the question. Students can then expand or correct when they get the next question. I will be checking this website a lot !!! Thank you for creating a site where teachers can always learn new things and validate old things!!! Thanks! This is GREAT because sometimes you don’t have time to prepare a Kahoots, etc. before class and here you can be spontaneous and it looks like it’s educational as well as fun. I was searching for an activity like this one for my rambunctious 4th graders and found your recommendation. It was quite a success! I teach Spanish, so I named it “Piensa, anota y gana.” (Think, score (also “jot down”) and win) ¡Gracias! My husband happened to be watching the video with me and he made a couple of suggestions that I thought were brilliant, so I thought I would share them with you. He said that the students could write the answers on white boards and hang them up to save on paper, and then they could throw ping pong balls into the trashcans. He also suggested that if they answered the question correctly, they get one point, and if they also got a basket, that could be two points. Thanks for the ideas. I think my students would love both versions. Hey Kathy’s husband: Those are both brilliant. Thank you!! I like the idea of 1 point for a correct answer and another 2 for the basket. We will be playing the game at our afterschool program starting this Friday. Played with my sixth graders for science vocabulary review and they loved it! Easy set up and directions. Got everyone involved and talking. Thank you! I like this idea, thanks. I’ve done something similar where I had a power point slide with a bullseye. If they hit the bullseye, 3 points, 2 for the next layer, 1 point for outer ring. This also allowed me to have all my questions prepared and placed in the ppt as well. Love the ping pong ball idea. Another idea for not wasting paper would be to shoot into a recycling bin. Question – do all groups shoot at once, or does each shooter take a turn? Hi Jolene, this is Debbie, a Customer Experience Manager with CoP. If you haven’t already, take a look at the short video in How to Play Crumple and Shoot. It demonstrates how to play and set things up — each shooter does take a turn throwing their crumpled paper. However, you can always modify the game any way you’d like to make it work for you and your class, or to just switch things up every now and then. Keep in mind, if shooters throw all at once, have them stand around the basket in a circle, each behind their own line. This way of playing might also add the element of teams knocking each other out. In the end, you’ll want to consider if this is something you want to be part of the game. Whatever you decide — Have fun! Shoot…into the RECYCLE bin, not the trash can. I love this idea. I’m curious though, I have two students with physical disabilities who would only be able to participate in answering, not shooting. Would you recommend me do this anyway in groups? Absolutely! Just be sure they are in a group that has a student who can shoot. I have had groups of kids where they always designate the same person to shoot every time, because they happen to be awesome at it. Other kids are highly sought after because they know lots of answers. Let each student shine where they are able! Thanks for the game. It’s always great to have another trick up your sleeve for when the technology fails. Great game, I used this for my first classes this second term. It was very spirited and broke the ice, and that was the target. Thank you, it made a difference and promoted a good start. I teach 4th grade where the end of the year unit is a simulation Gold Rush game. There are ready made questions for the kids to be able to learn additional facts about the era and earn “gold” there is an ultimate winner of the game. This would be a wonderful addition! I think I will go with the ping-pong ball idea suggested be someone and paint it gold. Thanks! You might want to check out Kahoot and Quizziz. Both have options for kids to play review games individually.